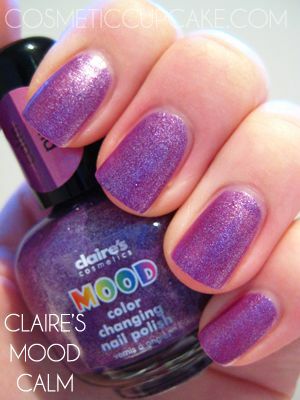 Cosmetic Cupcake: Claire's Mood polishes! 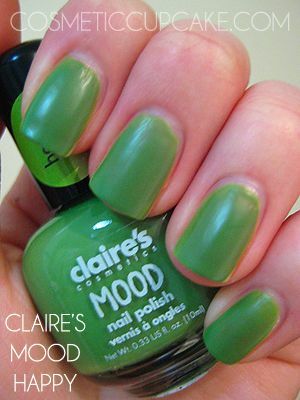 I decided to swatch my other absolutely awesome Claire's Mood polishes that Chris sent me in our swap while my nails were long. I used to like my nails long but now I can't stand them too long for an extended time (probably because of work). I decided to use Seche Base to see if it would help with the streaking issues I had with Awesome/Silly. Unfortunately for me, it didn't help and I should have read Chris' tip to use some thinner BEFORE swatching them lol ;) For next time! I also didn't use topcoat for these swatches. I know you guys will have seen loads of these swatches but I just have to share so bare with me =) Please excuse my very dry hands and cuticles! 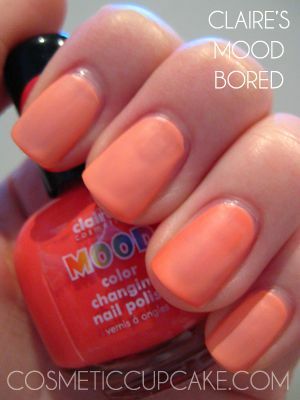 First up is Excited/Bored which is a bright orange/coral and light orange/coral creme combination. 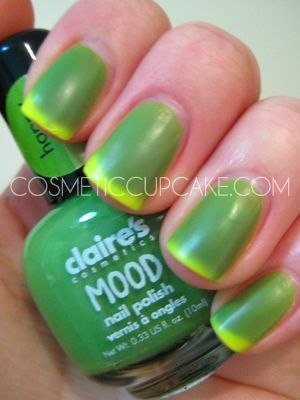 This would be fantastic in summer, can't wait for it to be warmer here so I can rock this colour! I found it quite thick and streaky to work with but 3 coats did the trick. 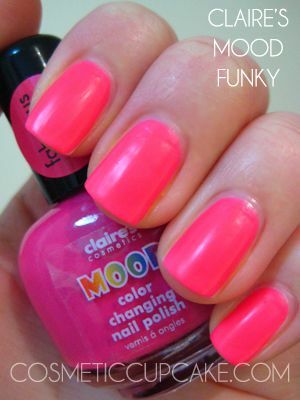 I love the fact that all the Mood polishes dry super quickly so 3 coats isn't too much pain! 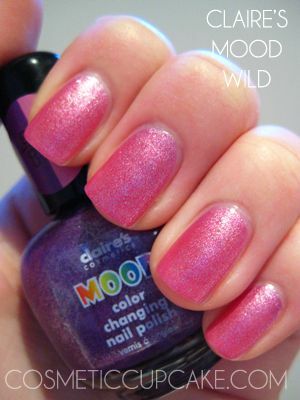 Then we have Calm/Wild which is a gorgeous shimmery purple and pink combination. This is my favourite of the 5 that Chris sent me! Both colours are so pretty and the silver shimmer is gorgeous! Plus I found it the easiest to work with and I only needed to use 2 coats. I wore this as a full mani after swatching the others! 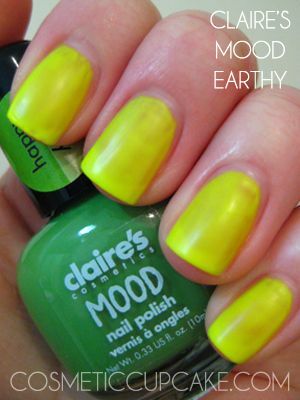 Happy/Earthy is a bright green and almost neon yellow combination. The green is really funky but it's very in your face green and the yellow is so bright!! I had some real difficulties with the formula on this one, very thick and streaky. Below is 3 (quite wonky) coats. Unfortunately I don't really like this colour combination on me. Lastly I have for you Fabulous/Funky which is a bright pink and neon pink combination. The colour change for Fabulous/Funky isn't as noticeable as the other colours unfortunately but still very pretty. I found the formula streaky but not as difficult as Happy/Earthy and below is 3 coats to get rid of VNL and streaks. you captured the color change sooo well! All the moodies look awesome on you! I like calm/wild the best! My favorite is Wild/Calm. These are awesome! Wow I love all of them!!!! I want Wild/Calm, next time I'm at my mall I'll have to pop into Claires. These are just amazing, I'm totally mystified, it's like magic! Gorgeous! They are all so cute and special. :) The last one is from now on my WL. <3 Great swatches! 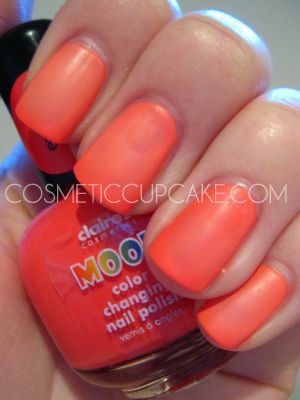 Those nail polishes are awesomely too cool! I want! I want!... I need!!!! calm and wild is the best one ever. I wish the bottle was bigger because now I need to get a back up bottle. the only problem is that I find that it chips really fast. @maRyya: They don't sell these in Australia either unfortunately =( I so wish they did! @Apple Juice: It's my fave too! I'm such a sucker for shimmer polishes. @myclumsyheart: Calm/wild seems to be a lot of people's favourite =) You can't go past purple and pink combination! Thank you for stopping by and commenting! @Jennifer: I have 5 but I want more! They are pretty darn cool. @Ena: Glad you like them! @Chris: I'm such a noob at swatching lol, I kept rushing the coats! I can't thank you enough for fulfilling this lemming for me =D I definitely think these are worth the streaks and application issues too! They are just too awesome! @Dhini: Hehe glad you like them! @Anita: Thanks hun! Calm/wild is my favourite of the 5, it's just so gorgeous! @How To Be Perfect: LOL it is like magic! I keep staring at my nails when I wear it o_O The colour change is just so cool! @Ivana: I agree! They are definitely very cute and special. The bottles are just so round hehe. Glad you liked my attempt at swatching! @Ansa: I can't wait to wear these in Summer, they are definitely perfect it! @Katya_noia: Yep definitely a big WOW from me too =) Thanks for stopping by and commenting Katya! @PinkOrchids: I hope you pick these up! They are so awesome and worth the application issues. Thank you so much for following me and commenting, I appreciate it! @Li Lian: Yeah I did notice it chipped quite quickly, about a day and half for me. But just so cool and pretty I didn't care! I looked up on eBay and they are so costly for a bottle! Madness!